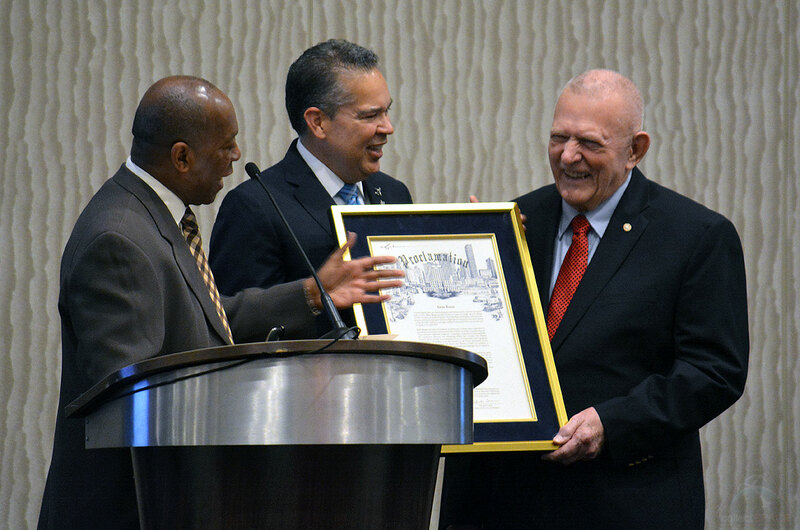 Houston Mayor Sylvester Turner announced the "Gene Kranz Day" in honor of the Apollo Flight Director at a Space Center Houston event on October 23, 2018. The To the Moon and Beyond lunch was also a win, earning $ 300,000 for the restoration of the Mission Operations Control Room at the NASA Johnson Space Center, where Kranz defined the principles of mission control. "Gene Kranz has made extraordinary contributions to the exploration of human space through the development of procedures and protocols that will continue to ensure successful missions," said Turner. "These processes emphasize tenacity, competence, teamwork and accountability." "As a Houston native, this is a very proud moment," Turner said, addressing Kranz in front of a room of 400 NASA executives, elected officials and executives at the Marriott Marquis in downtown Houston. "You really have not only put Houston on the map, but Webster, Friendswood and the whole area as well." 1 astronauts Neil Armstrong and Buzz Aldrin landed on the lunar surface on July 20, 1969, but perhaps he is best known for his role in rescuing a stranded moon-bound crew in April 1970, as presented by Ed Harris in the 1995 movie "Apollo 13". "Gene, we welcome you because they have made the concepts of" discipline, morality, tenacity, and competence "the core values ​​of mission control work," said astronaut Serena Auñón-Chancellor in a video recorded on the International Space Station. "Your legacy will enable us to continue the journey back to the moon and beyond." Over the past few years, Kranz has been driving efforts to make his former workplace – NASA's historic mission control room – look the way he looked at the first moon landing. Space Center Houston, as the official visitor center of the Johnson Space Center, has led the $ 5 million campaign to complete the restoration in time for the 50th anniversary of the Apollo 11 mission in July 2019. "Today is truly monumental because we've worked to raise $ 5 million to restore the mission's historic control room, and we're getting closer to that goal," said William Harris, President and CEO of the Houston Space Center. "All the proceeds of today's lunch flow into these efforts." The city of Webster, a suburb of Houston, provided the primary donation of $ 3.5 million in 2017. A successful Kickstarter campaign brought in another $ 500,000. The $ 300,000 lunch "To the Moon and Beyond" on Tuesday brings the total to 4.5 million. Three Apollo astronauts participated on Tuesday, including Walt Cunningham, who flew to Apollo 7 for 50 years before this month, and Charlie Duke, who was walking on the moon in 1972 on Apollo 16. "I would be remiss if I had two special donors who are here today, Apollo-8 astronauts and Major General Bill Anders and his, unrecognized wife, Valerie," said Gwen Griffin, event director and daughter of Apollo flight director Gerry Griffin. "When Bill received the invitation to lunch today, he wanted to surpass the rest of us, so he created his own level of support." [Anders] He [Anders] called this level "Go for TLI" in the space industry know stands for trans Lunar injection. Apollo 8, Bill's flight, was the first time we sent a crew to the moon, and we went "on TLI," Griffin said. "It was really great to be able to work in mission control," Kranz said, standing next to the other Flight Directors Griffin and Milt Windler. "We thank the members of the Mission Control Flight Support Department and the Houston Space Center for their efforts to Make donations again. "